Oregon Ducks: 2012 Rose Bowl Champs! It’s been a long time since I last posted, and yes I still use Batch as a photosharing app, but it seemed like the Oregon Ducks winning their first Rose Bowl in 95 years was a worthwhile occasion. It was an amazing game against Wisconsin, and the Ducks continued to push the envelope with their explosive offense and style. Great season. Go Ducks! I’ve tried out just about every iPhone photo sharing app, and many of them are quite good. I’ve mostly been attached to Instagram due to the ease of use, design, and the biggest user base means I have more people to follow and to share photos with. One of the biggest problems with photo sharing apps so far is that they all tend to only allow you to share one photo at a time. While this keeps the quality of photos shared high, it creates some problems. It’s a painful process if you want to share multiple photos from an event, as part of a theme, or just to get photos off your phone and put them in a place they can be shared without the painful process of downloading them to a computer and then uploading them somewhere. Tonight Mike Arrington broke the news that the team at self-photo taking startup DailyBooth recently launched a photo sharing app called Batch for the iPhone. The design is beautiful. I love the handwritten instructions that overlay the screen in certain areas, and it walks you through how to use the application really well. Uploading photos in a batch is great. The first time I got to touch multiple photos and have them uploaded at once I saw the value in the speed and simplicity of sharing the photos in a batch. Automatic friend connection via Facebook makes it nice to not have to worry about building up my social graph. As friends join Batch, we’ll just get connected. Simple. This has some downsides in that you can’t customize who you follow or don’t follow yet, but I prefer it over having to start from scratch and manually choose everything and hope my friends find me. If you have an iPhone and share photos, give Batch a try in the app store. I posted recently about how much there is to be learned from the stories of startups failing. As investor Bryce Roberts from OATV points out, this postmortem from former OATV investment GameLayers is very detailed with a wealth of knowledge. There’s personal stories, videos, pitch decks, charts, and pictures that really take you through the ups and downs of the GameLayers startup experience. It’s definitely a worthwhile read. While it’s not a startup failure post, I found this detailed post from Gabriel Weinberg of DuckDuckGo to be much more interesting and helpful than reading a generic blog post about their funding news on all the tech blogs. Kudos to Gabriel for being open and sharing his fundraising experience. At the recent TechStars Demo Day, Gary Vaynerchuk spoke about his concern with the current trend of celebrating the startups who raise money. It’s easy to understand why the media, investors, and us all as individuals in the startup/tech world tend to focus on the stories of fundraising and hot startups. It’s positive, exciting, and it fuels the dreams of so many involved. Gary’s point seems to be that we should celebrate the startup that knows how to make money instead of raise money. It’s a good point, but I think when startups make money at scale that’s celebrated quite a bit by everyone. The problem I see is that these stories paint a picture that everything is great out there in startup-land, it’s easy to raise money, and that if you follow some simple steps you can also raise money and get on Techcrunch. Besides the inaccurate picture that’s painted, there’s frankly not much to be learned from hearing about a hot startup with a strong team, that’s executed their product well, and raised money from A+ investors. While it’s a feel good story, there’s not much in that story that’s easy to learn from or duplicate. Where there is something to be learned is from the startups that aren’t making it. The startups who are not finding product/market fit, the ones who can’t raise money, who are having team problems, or are failing for some other reason. I’ve learned far more from the few startup postmortems that founders have posted than I’ve learned from the thousands of “Startup X raises investment” stories that have been published this year. These stories are somewhat hard to find, as founders are often less excited to publicly talk about their failures. However, it’s also because there is no publication that’s really giving these companies and founders a voice. The solution is a blog that specifically covers startups that have failed, are currently struggling, or that were on their way down before pivoting to find success. This isn’t meant to be a site that gossips or mocks these startups like F—edcompany.com did back in 2000, but one that seeks to pull out the lessons to be learned and positive experiences that can be drawn from them. I’m tempted to start such a blog, but I’m busy working on my own company and don’t need the additional distraction. Who’s up for building a publication that could be very valuable for the good of the tech world? I never met Steve Jobs. I don’t have any neat stories to tell about him. However, similar to everyone else, I feel like there’s a little less magic and mystery in the world now with his passing. 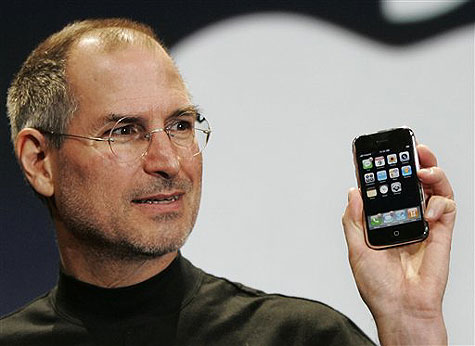 Jobs’ creations at Apple held an important role in my path. My first personal computer was one of the first PowerMacs where I did my first HTML programming. Shortly thereafter, my first “real” business adventure was buying thousands of dollars worth of broken Apple IIe computers from our school district with friends, fixing them up in a garage, and then reselling them for profit. I reflected today on my own experience with Apple products along with Jobs as a visionary, entrepreneur, leader, marketer, salesman, and more. While doing this, I began to think about my nine, seven, and three year old kids, and I actually felt sorry for them in a weird way. These kids never lived without the magical touch computing of iPods, iPhones, and iPads. They instantly accepted and became familiar with these products before ever getting a chance to know what it was like before they existed. They didn’t get to realize how crazy it is that my parents record collection multiplied by 100 could be stored on a tiny and easy to use device. They didn’t get to try an iPhone for the first time like I did and mentally compare it to a rotary dial phone, and then think to themselves “Wow, I’m living in the future!”. They didn’t get to figure out that at one point it took tons of hardware devices to accomplish what they do when they instantly play games, surf the web, take pictures, shoot video, watch movies, listen to music, talk on Facetime, and more all on a sleek tablet. Lastly, I fear that my kids generation may not be as curious and as driven as Steve Jobs and his brethren were on revolutionizing technology. If everything just works so well and and is so easy, will they challenge the status quo to create their version of what the future looks like? While there will never be another Steve Jobs, the optimist in me believes that he already is inspiring the current generation of entrepreneurs, and that his legacy and products will continue to inspire future generations to come. Thanks Steve. It was a big day at Yahoo! yesterday, with Kara Swisher breaking the news that Carol Bartz was fired as CEO (over the phone no less). I found the firing over the phone ironic. 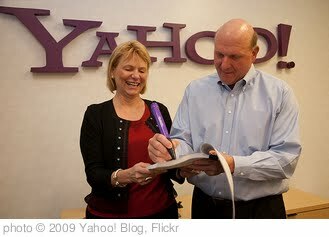 When I was vice president at Yahoo! during the layoffs in 2009, I was requested to lay off 6 members of my team in person on the same day across three offices intwo different states. Naturally, I did as asked despite the impossible travel day it created, as I believed it was the right thing to do to have in-person conversations with people in those tough moments. Apparently Carol wasn’t given the same courtesy. As news broke about Bartz’s ouster, the consistent chorus of people calling Yahoo! doomed or irrelevant began to ring out. Yahoo! has indeed been troubled, but I believe it can and should be saved. Yahoo! wants to be the “premiere digital media company”, which is the right goal based on their strengths, where the world is headed, and what their competitors are likely to focus on. Let’s take a look at those strengths. Let’s take a look at where their top US properties stand with competitors using data from Compete.com. Yes, I know Compete.com is far from perfect with it’s numbers and even trends, but there are few choices for public data analysis and the ranking should be correct. If we just compare against similar “portal” type front pages, Yahoo!’s front page is #1. There aren’t many personalized portals like My Yahoo! left, but Facebook and Twitter seem like the new generation of this to compare against My Yahoo!, which still has a tremendous amount of traffic. This is a gigantic category where Yahoo! crushes the competition. Yahoo! Mail has been the leader in email for a quite some time. If anything there is a larger threat from Facebook messages, mobile texts, and other forms of communication than from direct competitors. The big daddy of properties, Search is a primary revenue driver. While the Comscore data has Yahoo! and Bing being close and flip-flopping, Compete does have Yahoo! Search at #3. One of Yahoo!’s anchor properties, Yahoo! Finance is a traffic powerhouse. Google Finance traffic data can’t be pulled out, but it’s definitely not close to Yahoo!. Tough to measure how Facebook and Gmail chat compare here since neither one is broken out in the Compete data. If I had to guess, I’d say Yahoo! is ahead of Gmail chat but I’m not sure what Facebook’s usage looks like. 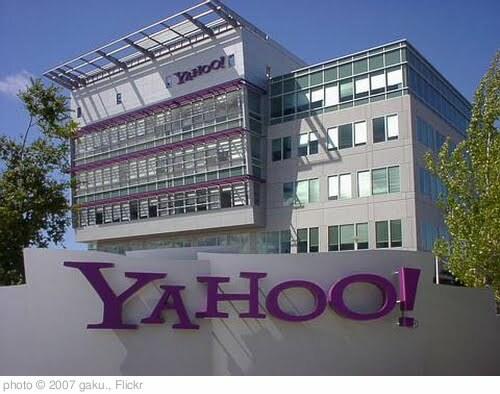 Another one of Yahoo!’s outstanding gigantic properties, Yahoo! Sports is the leader in game even though ESPN calls itself “The Leader”. OMG is a great example of what Yahoo! can do, as OMG launched later then competitors and is now dominating them. Like OMG, this is another newer Yahoo! property that started much later in the game but is now crushing the competition. The competition is really close here on the Compete data so this order could end up being wrong. The Compete data has Mapquest being ahead of Google in web visitors, but with mobile factored in Google is the clear leader. It’s a very competitive space, but Yahoo! still puts up a good fight against some heavyweights. Quick, who’s the biggest real estate site? Answer: Yahoo!. 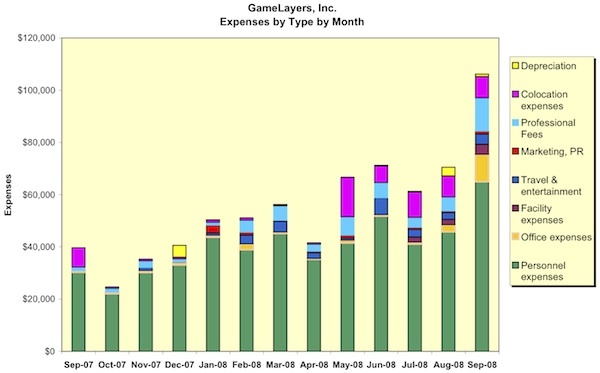 Gaming is now getting fragmented with web-based games, games on Facebook, and games on mobile. If we look at just web-based games including Zynga on Facebook, Yahoo! comes in at #3. This is one of those “kind of silent but really powerful” Yahoo! properties. How many startups would kill to have 20M users like Yahoo! Movies does? Would you have guessed Yahoo! Music was #1 in music properties with over 18M estimated users? Me either. This is a dangerous one though as music consumption changes to become more mobile and application-based. Once again, the quiet winner you probably wouldn’t have guessed is Yahoo!. When it comes to comparison shopping engines/portals, Yahoo! comes out on top again. To be fair though, Google’s “shopping” section can’t be pulled out in Compete data, but it’s not really the same type of shopping portal. Amazon.com and eBay are also larger, but are different types of sites. This is harder to tell traffic on with Compete as Yahoo! has a subdomain for it but redirects it to sports.yahoo.com. Despite that, while working at Yahoo! in 2010 I know that Yahoo!’s Fantasy Football was #1 in the market, so I’ll hazard a guess that it’s it’s in the top 2 in this lucrative market. While Quora gets all the tech industry buzz these days, it’s still tiny compared to Yahoo! Answers. It’s a long way off in traffic from YouTube, a long way….but Yahoo! comes it an #5. Yahoo! is quite a bit behind market leader Weather.com, but #2 isn’t bad. The data isn’t broken out, but we’ll assume Facebook Groups are now getting more traffic than Yahoo! Groups. Yahoo! Health has a strong showing in another very lucrative advertising category that also generates high traffic. Despite entries from all the portal companies as well as industry powerhouses like Autotrader, Edmunds, and Cars.com, Yahoo! Autos comes out on top. While not the sexiest category these days, it still drives millions of users. Yahoo! is #2 in downloads and is very close in traffic to #1. Yahoo! outsourced their Greetings to AmericanGreetings.com, but their subdomain still comes out to #4. Comparable data is not in Compete, but Yahoo! Calendar is either #1 or only surpassed by Google Calendar for web-based calendars. Comparable data is not in Compete, but Yahoo! is in the top 3 for web-based address book with Facebook and Google. Apple is obviously a huge player with this phone-based address book now. It’s actually quite shocking to run through so many important categories and see that Yahoo! is a leader or one of the top companies in that space. Any of their positions alone would be an amazing startup or growing company, but doing it across so many categories is really impressive. It may not be flashy, but Yahoo! is getting the job done in a bunch of those spaces. Additionally you can bring in other businesses here that aren’t really “consumer” facing like Yahoo! Small Business, Web Hosting, Domain Registration, Yahoo! Ad Network, Right Media Exchange, and others. Also not covered above is how Yahoo! fares internationally in many of those properties in other countries. It’s all over the map (literally), but some of the international regions are stronger than the USA in overall dominance. Not to mention the ownership value of various Asian assets. What makes Yahoo! vulnerable is that they are doing well in all those categories above, but primarily just from a desktop computer experience. Facebook has already been stealing Yahoo!’s thunder in various categories for a while now, but it remains a huge threat. Facebook doesn’t compete with Yahoo! on identical products, but does things like make a traditional front page unnecessary, or replacing email with Facebook messages and instant chats. If or when Facebook starts making moves into running their own socially-enabled properties like “Facebook News” or “Facebook Sports”, Yahoo! may have even more trouble ahead. Handled above by the Facebook effect, but Yahoo! will continue to lose out to Facebook and other social applications if it doesn’t improve rapidly in this area. It’s not for a lack of trying, but Yahoo! has now essentially outsourced a lot of their social stuff to enabling Facebook and Twitter on their properties. Compared to Google, Facebook, and Apple, Yahoo! 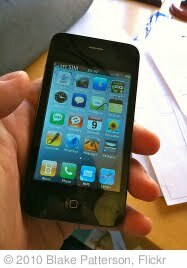 is very far behind in the mobile world. It’s clear they’ve already lost as far as “utility applications” are concerned on mobile devices. The question they need to ask is how they make Yahoo! News the default mobile news application across all mobile devices? How do they make Yahoo! Finance the default financial application? They don’t seem to be moving aggressively enough in their leading categories to become the “premiere digital media company” on mobile devices. It’ll be interesting to see where Yahoo! goes next with their leadership and strategy. They have a lot to work with as you can see from above, and I know a lot of talented people are still there looking to make it happen. Normally I wouldn’t make a blog post about a phishing email, but tonight I received one that didn’t get caught by Gmail’s spam filter. It had me believing it was real since I hadn’t seen phishing email pretending to be Twitter before. 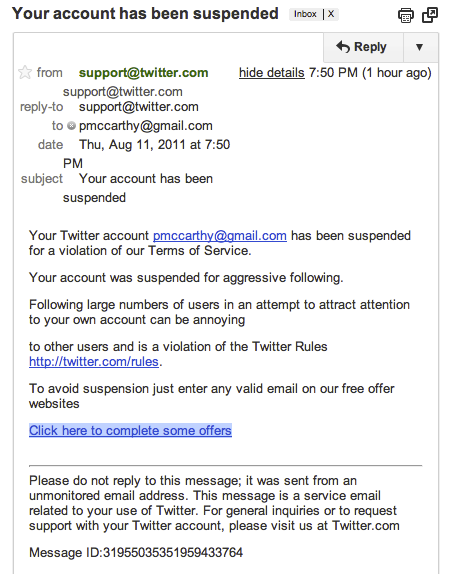 The email was supposedly from the address “support@twitter.com” telling me my account was suspended for excessive following. You can see a screenshot the email to the right. While I knew I hadn’t recently followed a bunch of people, I thought maybe someone had hacked my account and followed people and that the email might be legit, until I read that I needed to click a link to “complete some offers” for to avoid account suspension. Further examination revealed the link to be “http://mexico.cnn.com/redirectComplete.php?url=//bit%2Ely/ouvgwt” which redirects to “http://emailus.it.tc/” where you can see offers to complete. Obviously, not from Twitter. Beware. Google Plus Rapid Growth: Will It Last? The above graph was created by Leon Haland and featured on Techcrunch Europe. The tech media has been all over the rapid growth of Google’s social network Google Plus. Many have assumed that this rapid rise means that Google Plus is on it’s way to be a serious competitor Facebook and Twitter. After my usage of Google Plus so far both sharing and reading, it’s definitely a solid product that does some things better and some things worse than other social tools. However, I’ve yet to feel like it’s on it’s way to truly competing with Facebook or Twitter. Familiarity with Social Networking – A larger number of people are now familiar with social networking than when Facebook and Twitter launched. They also have more friends and are more connected making it easier to hear about a new social network and decide to go try it out. 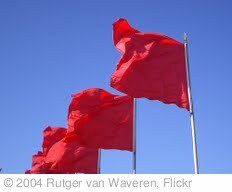 A Desire For An Alternative – While Facebook and Twitter are massively used, there are a large number of users who don’t love them as products themselves and have the desire for an alternative. Google Plus is really the first serious alternative to launch. Google “Install” Base – So many people already have Google accounts and use Gmail, that it made it super easy to explose Google Plus to users as well as make it easy to intelligently recommend Gmail contacts to invite. Will Google Plus Keep Growing? Google Plus was reviewed well by the tech media, and it feels pretty good as a product. However, after a few weeks now I’ve got over a 100 people in my “circles” but the only activity I’m seeing is from about 5-10 people who all have jobs as part of the tech media. There is literally NO activity from most of my normal friends, many of whom are on the cutting edge of technology and are heavy social network users. Why is this? I’ve asked a few of them, and the answers tend to be that they don’t know why they should use Google Plus instead of Facebook or Twitter. Their friends aren’t fully there yet, they don’t really feel the need to organize them into circles, and Facebook and Twitter just do a good enough job. Google’s going to need to do something to differentiate Google Plus even more from those competitors and do something SIGNIFICANTLY better than the competition in order to get people to spend more time there. It’s definitely possible, but it’s a tough task that won’t be as easy as the initial spike of growth in the graph above.